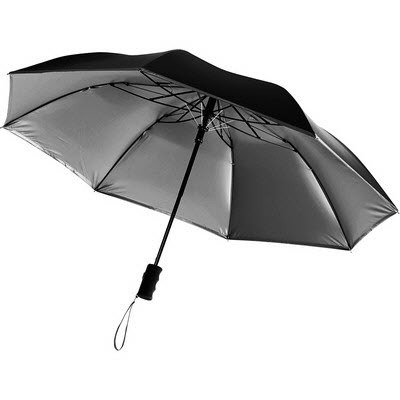 Description: Auto opening umbrella. Polyester canopy with colour pop under canopy and matching button on handle. Carrying sleeve with colour matching 2 inch cuff. Available in 3 colours. Features: Two-section folding metal shaft. Ergonomic black rubber coated handle with wrist strap. Folds to 16"" long. Packaging: Polybag Colour: Silver/Black Material: Polyester Product Size: Folded: 406mm, Open: 1066mm Freight details : 40 per carton, 13kgs, 42.5 x 39 x 21.5cms; Decoration Type(s): Colour Print / Full Colour Print Decoration Area: 150mm(w) X 120mm(h). Price includes : Item incl 1 panel with a 1 colour print. Setup is included.